BEZANTS!!!!! Bezants bezants bezants BEEEEEEZZZZZAAAANNNNTTTSSSSS!!!!!! I’m fairly certain that my mother was the only person in the aisle who had any idea what I was talking about. Tee hee…. It’s the small ones in the top baggy that I was interested in – they’re the right size, and they don’t have too much curve to them. I counted when I got home, and I’ve got 60 of the right size to play with. Yipeee! 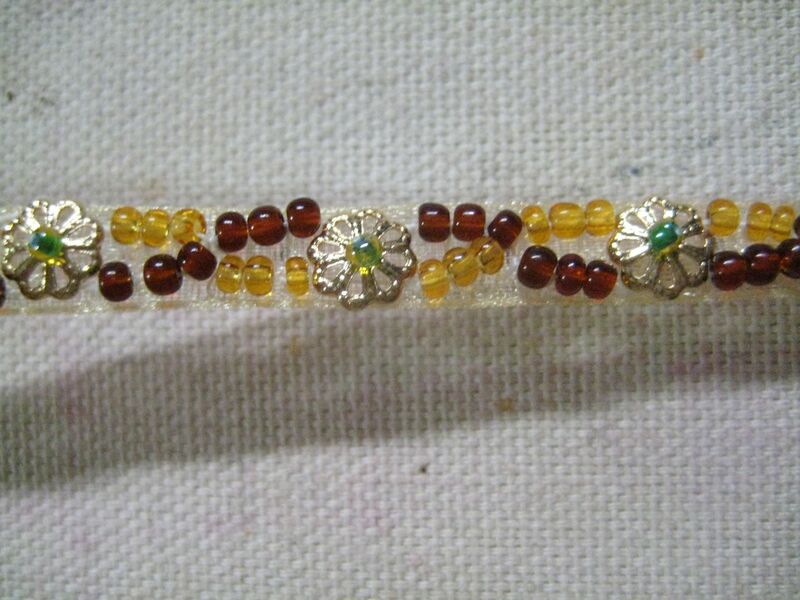 Since I need strips of beadwork, I'm using ribbon. The organdy is sheer enough to fade away in the background. 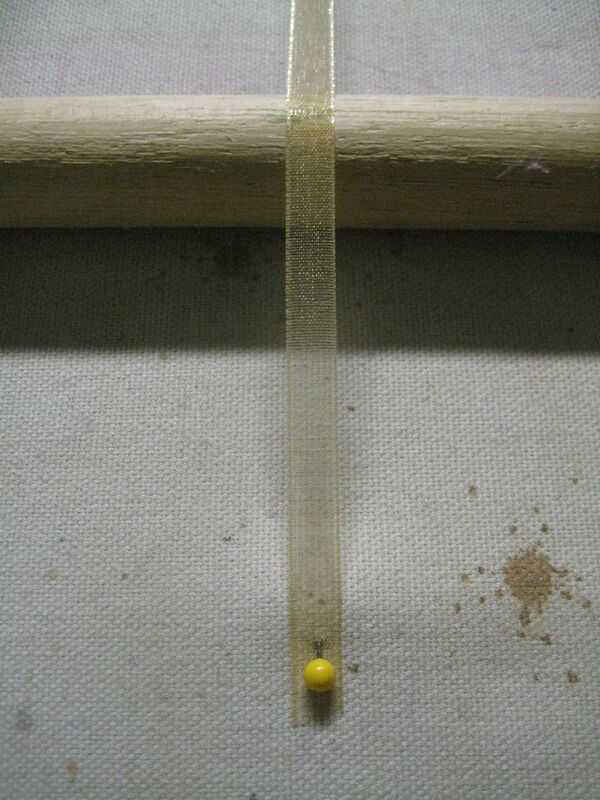 The ribbon is 1/4" wide, which is just right to fill in between my two little gold cords. 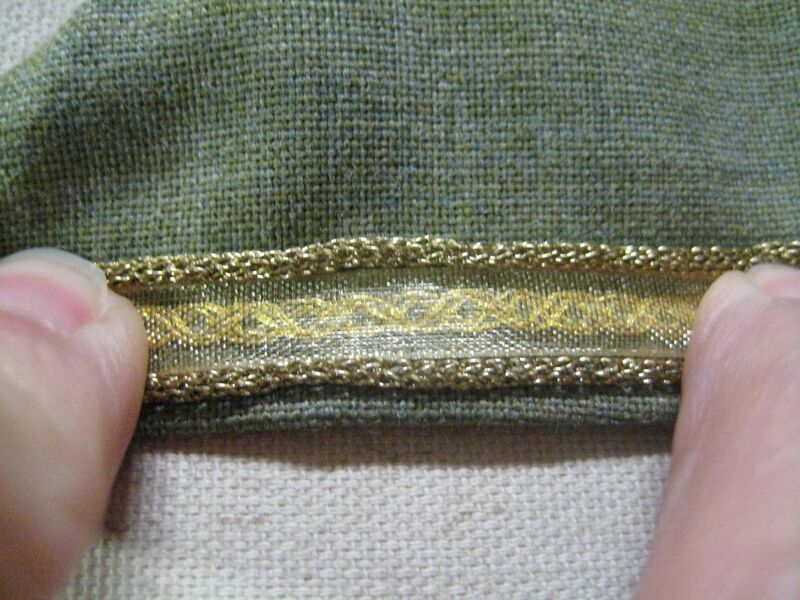 The flat braid in the middle will be removed. Le sigh. To keep the ribbon under tension, I've pinned both ends to the table. I'm using a dowel rod to raise it up so I can sew. You really can’t tell, but I’ve also marked just how much I need to work to make it around a sleeve. I did this very discretely, with a giant silver Sharpie. It’s pretty hard to mark organdy… I plan to do this sort of beading to finish the neckline (which has been defying me) and the hem, but I’m starting with the sleeves because they’re easy – straight, relatively small, no corners… I like that. The joy of this couch method, I feel, is that you can work with multiple strands of different colors at once. 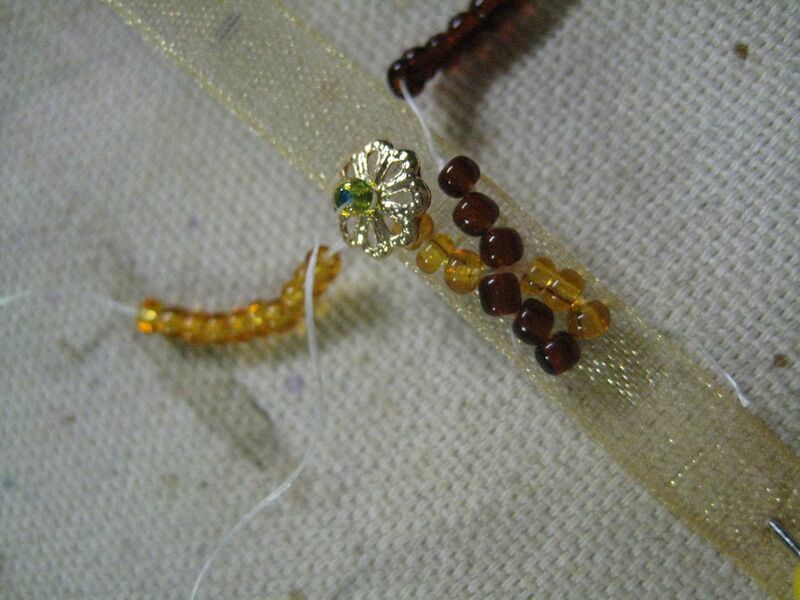 I've secured two bead threads in the ribbon, and threaded one with dark brown beads and one with amber. A third thread has been secured to do the couching. by “secured”, I really mean that there’s a knot at the end. I’m planning to use the couching thread to secure the bezants. I don’t know if that’s correct or not, or even if I’m supposed to be using one couching thread for multiple colors, but it seems pretty logical to me. Also, this is a fairly teensy little ribbon, and three needles seems like more than enough to me…. 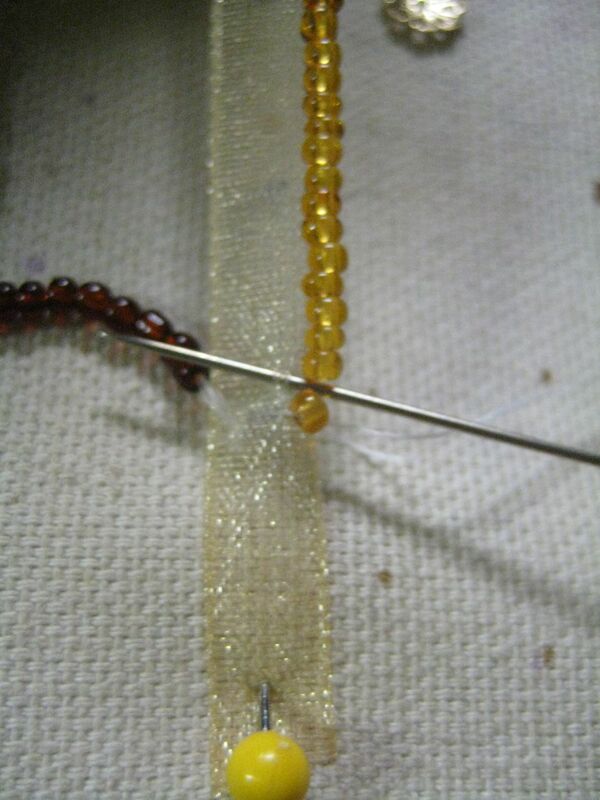 To couch, bring the couching needle topside next to the space between the first and second bead. Pass the needle over the bead thread. 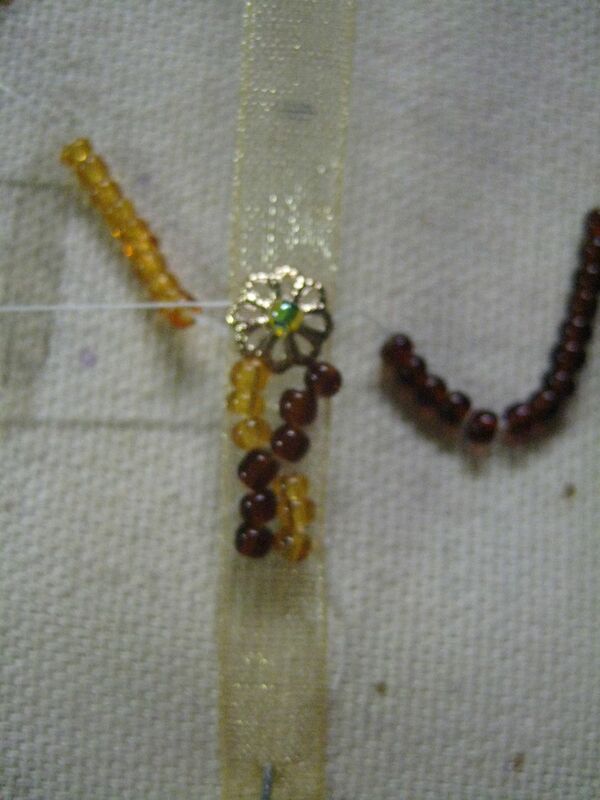 Since I'm going to couch the brown beads next, I've picked up a few threads from the middle of the ribbon. If you’re not running multiple lines of beads, you’d just pass your needle down and return it topside at the next bead space. Since I’m working multiple strands of beads with one couching thread (read: lazy), I’m picking up that little stitch in the middle of the ribbon, then passing the needle over the next bead thread before going back down to the wrong side of the ribbon. I ended up working from right to left for the first pass, then left to right for the second, etc, instead of always going one direction. It seemed easier. My thread goes through the hole at the center of my little bezant, and through a small green bead. Now the thread goes back through the center of the bezant and passes back down to the wrong side of the ribbon. The bead holds the bezant in place. I've finished about half of one sleeve. That took the two hours I had available. Have I mentioned that I am the world worst beader? I had to move the project off my sewing table so that I could, you know, sew. I transferred it to a padded noteboard I made year’s back – you know, the ones that hang on the wall that you can pin postcards (or, more usefull, fabric swatches) to? They were quite the thing a few years back. 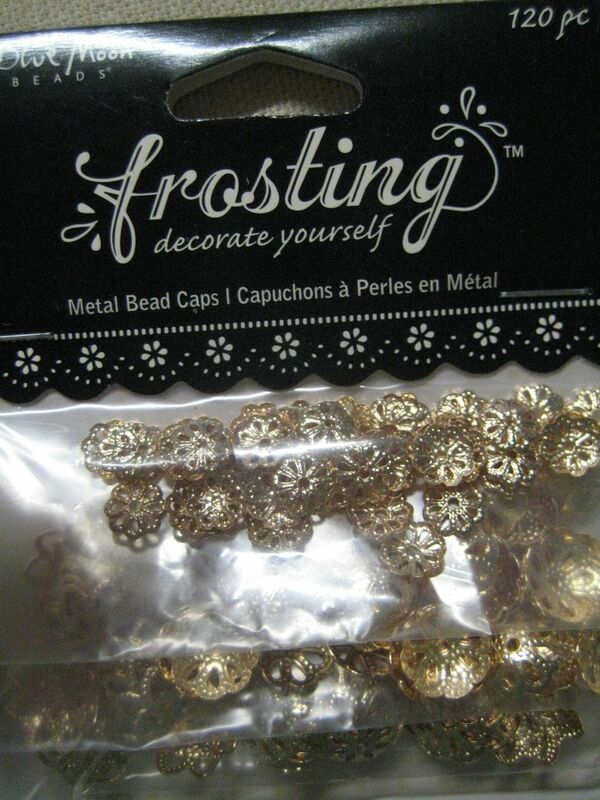 Anyhoo, I realized that this is the single most portable style of beadwork I’ve ever seen – your beads are pre-strung, so you don’t have a billion little containers of beads to take with. If this were hooped, I’d just need to bring the working hoop with the string beads, a spool of thread and snips and I could work anywhere. The fact that I could do this on the couch at night, without fiddling with the beads themselves, really increases the likelihood that this will not end up in the forgotten projects bin. No, really, I have a box labelled “Finish someday”. There’s another one lavelled, “Immediate gratification – almost done, easy to finish”. Would you like to guess how many things have ever come back out of that box? By “collar”, do you mean the decorative band that follows the neckline on some gowns, or do you mean the standsy-upsy-around-the-neck-covers-shoulders-too business? The jeweled band above the heavy gold chain. Thoughts? Oh! The choker-looking thing! Got it. Grab any ol’ pattern with a standing mandarin-style collar. The collar is the piece you want. Change the cut so the center front is on the fold and it opens at the back. 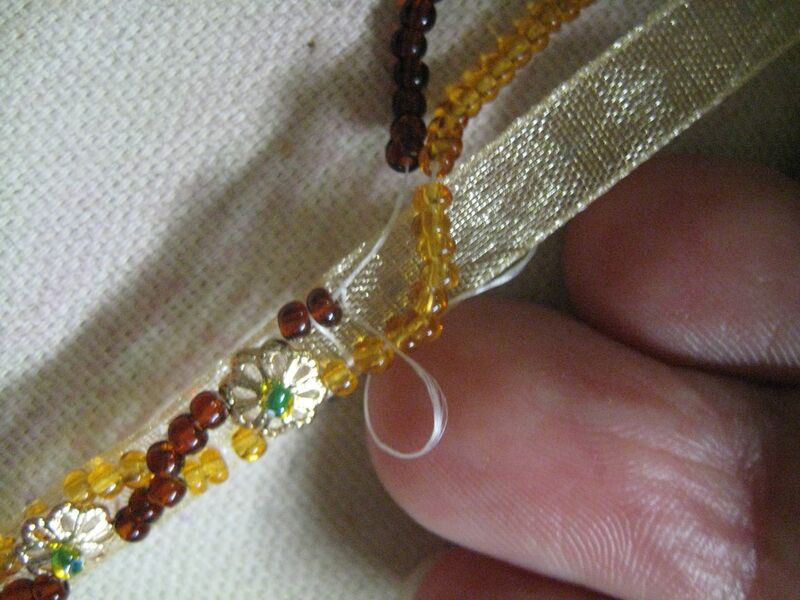 Make it with a decently stiff interlining so it will support the weight of the beadwork, etc without wrinkling. This will be less comfy, but it won’t stretch out on you. Then dec the snot out of it. ;) I’d cord the edges, just to define it, and combine applied cording, beads, and maybe some larger mounted-gem-looking-things. I have nothing helpful in my brain about what the Right Way(tm) to make this would be. The mandarin collar pattern will get you something that fits close to the neck. The curve will go a little lower than the picture of Judith, probably, but only by a hair so it should get you where you’re going. I wasn’t sure if the beadwork technique you had demoed (sp?) was the “correct” way that they beaded these things Back in the Day. I had an idea on stiffening it, but wasn’t sure if there was One True Way to bead the sucker. I have seen it made of Fimo (no lie!) but I kind of love your cheat method. Hee. If I was to be All Historically Accurate and stuff, would I bead it the way you did the other one? I don’t know. The only research I’ve read on the use of this type of bead couching technique dates it to the eleventh century. I don’t know how far forward it goes. My gut tells me that beading isn’t generally one of those areas where there’s a huge amount of rapid evolution of methodology and technique, so regional methods probably hang on for a good long time. I mean, beads change in shape, material, etc, as style dictates, but they’re still basically a thing with a hole in the middle. 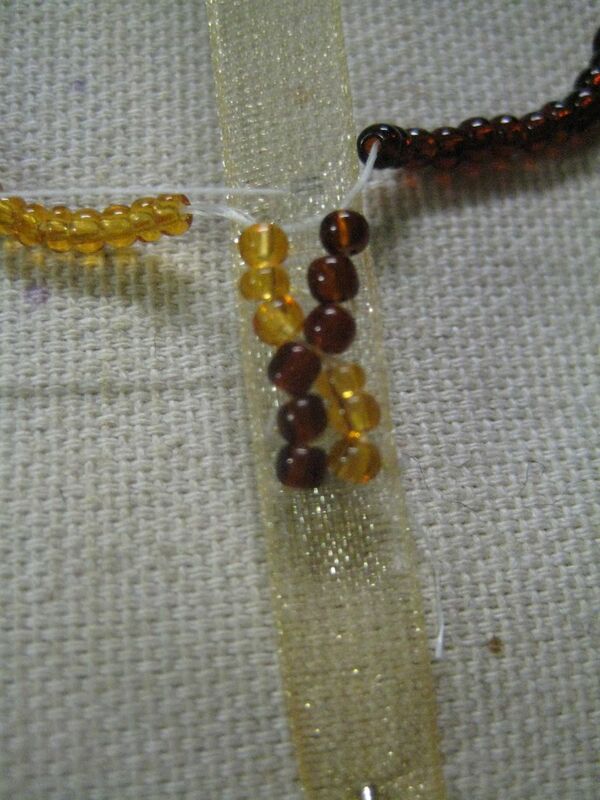 You don’t see anyone going crazy developing beads with two intersecting holes to create beads that are twice as likely to get onto the darned needle, or sudden trends of double sewing and knotting off every bead to make the work more secure. But a gut feeling is a far cry from actual information… :( Sorry. Hey thanks! That is a great site. So, I’ve re-read the description given for the couching technique about 32 times over the last 48 hours (obsess, much? Not I…), and the only thing I’m still really not sure about is the ratio of couching threads to stringing threads – there’s no clear indication of whether it’s one-to-many (as I did) or if it’s strictly one-to-one.